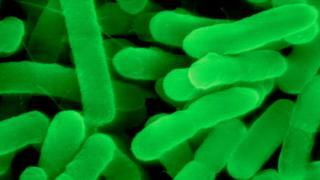 A superbug that could not be treated with 26 different antibiotics has killed a woman in the US, officials report. The 70-year-old from Nevada had returned to the US in August with an infected swelling in her right hip after a long stay in India. A Centers for Disease Control and Prevention report said the infection was "resistant to all available antimicrobial drugs". The women had repeatedly needed hospital treatment in India after breaking her right leg. An infection got into the bone and then spread to her hip. She was seriously ill when she arrived in a US hospital - her immune system was going into overdrive in an attempt to fight the infection causing inflammation throughout her body. This escalated and ultimately she died from septic shock. Samples of the infection taken from the wound were sent to the CDC for testing. They showed she was infected with Klebsiella pneumoniae - which normally lives in the gut without causing disease. The analysis found the superbug was resistant to all 26 available antibiotics in the US including the "drug of last resort" - colistin. The CDC said: "[Infections] that are resistant to all antimicrobials are very uncommon." But the case remains a warning of the dangers of what the CDC calls untreatable "nightmare bacteria". Some scientists have argued we are on the cusp of the "post-antibiotic era" with cases like this in Nevada becoming more frequent. Dr David Brown, chief scientist at Antibiotic Research UK, said: "It is still quite unusual for a bacterial infection to be resistant to such a large number of antibiotics. "Fortunately it is an extreme case, but it may soon become all too common. "It happened because of her personal history of multiple hospitalisations in India, however, the ease of global travel does mean that such cases will increase." The tests showed the bacteria did have low levels of resistance to fosfomycin - but that is approved in the US only as an oral treatment for uncomplicated cystitis. Prof Laura Piddock, from Antibiotic Action and the University of Birmingham, said: "Despite such multi-drug resistant bacteria being rare, this report is a salutary tale of the dire outcome for some patients when potentially useful drugs are not available. "In circumstances such as this, where doctors are faced with the inability to treat a life-threatening infection, they need the flexibility to use antibiotics licensed for use in other countries and shown to be active in the laboratory against the patient's infecting bacterium."